Editor's Note: Writers Shadow Schemes are run for all the BBC's Continuing Drama shows - EastEnders, Doctors, Casualty and Holby City. They mirror the show's writing process by developing and producing an episode from which the writer will be assessed for a commission. Training includes workshops, lectures and exercises on storytelling and the show's format together with a formal induction and set tour. There are eight writers on this year's Casualty Shadow Scheme including Olly Perkin who blogs about his experience so far. The Casualty Writers Shadow Scheme has been a great learning curve about how not to write the show, as well as a really positive guide on what makes the show really sing. Tipped off by my agent that the scheme was approaching again, this year was my second try. After the initial application process of a spec script followed by an interview selection, you pitch a story of the day for Casualty. A final selection is made based on extending those pitches. I’ve previously written for Family Affairs and The Bill, as well as having clocked up nearly 60 episodes for BBC’s Doctors, but it’s exciting to have the chance to work on a bigger canvas. Especially one where you can write a cracking stunt to kick a life or death story into the second act. 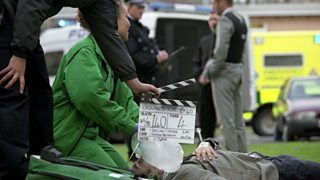 I really enjoy Casualty as a viewer too, so getting an opportunity to become a part of it from the inside is a bit like being given the keys to the Magician’s cupboard. And behind that cupboard door is seriously impressive… The selected writers met first in Cardiff for a helpful talk by Lucy Raffety the Story Producer, Anne Edyvean, Producer, and our dedicated script editor Sophia. Then we had a tour of the studios. I was stunned: the Casualty set is amazing. It’s absolutely huge; it really is like wandering into a large, but weirdly quiet hospital- and then you notice the cameras. It was really inspiring to explore it all and imagine the potential for stories, scenes, movement, trolleys bursting through double doors. And then there was the Prosthetics props room…disturbing. One box on the racks of shelves was labelled: ‘Ears & Eyes’. Next to it was: ‘Fingers.’ That will stay with me for a while. 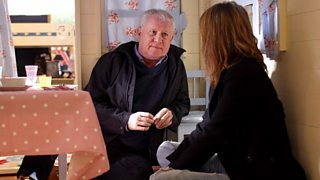 Casualty's Charlie Fairhead played by Derek Thompson. 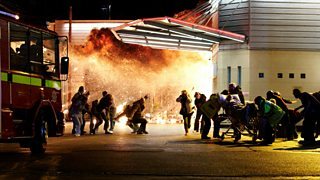 Fire ravages Casualty in an episode from 2011. As I write this, a week on, I am at my desk gnawing at my trial pitch like a dog with a bone, trying to create the blueprint for an episode that just flies off the page; packed with energy, pace, action, humour, highs and lows of human emotion, all played out over fifty minutes in the crucible of the ED. Well, I never thought it would be easy…. Up next is the daunting proposition of verbally delivering our pitches to the Casualty team at a commissioning meeting. Then we write a scene by scene and two drafts before crossing the finish line pre-Christmas and ultimately getting a decision on whether we are offered an actual commission in 2016. The Shadow process has many hurdles but the final one is the ultimate: your script, your story. The highlight for me is that Casualty genuinely seems to want to allow the writer to write; to create a space within its framework for a unique voice and story set squarely on the battling NHS frontline. It’s fighting to retain the true spirit of an original, compelling Saturday night BBC Play For Today. And that’s why I’d really love to write it. Fingers crossed. Real ones, that is.